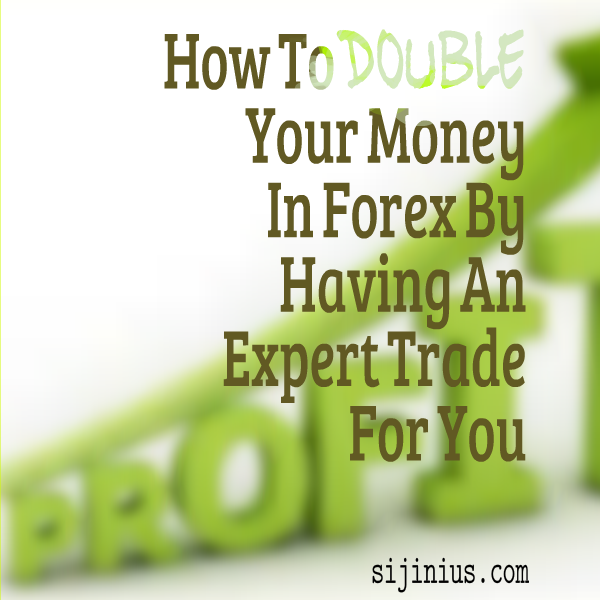 I am so sorry if in this series on Forex trading, I have not really told you how you yourself can trade Forex. In all honesty, I don't know how to teach Forex trading with just a few articles. The headline of my last article 'Summarizing the lessons I have learnt in Forex', is actually meant for this one. Or better, this article is supposed to come before that one. But my promise to you is that by the time you have gone through this article, you will be very enlightened if you still consider learning about Forex trading. And I will have disabused your mind from thinking of Forex as scam, as gambling and/or, as another online way to just lose money instead of making money. The first that comes to mind is babypips.com. Most Forex brokers today offer free educational tools and classes. For example Instaforex has a free distance Forex learning course if you deposit at least $100 into your live account with them. For Nigerians, you can use (this) Instafxng.com's education program link. Others include Forex Education, Fxstreet's free education resources. Like I tell my students, if you lose money because you are not knowledgeable, that is your fault. Fxstreet actually offers free webinars and a free economic calender that you can even put on your site. I have a couple of free ebooks too, but you can download online for free yourself at many of the sites I just listed above. You can use free signal providers like instaforex's daily signals, or paid signals such as some of the Forex signals reviewed in this list. But be very careful with them. It is by far better to learn to trade successfully first and not put all your hopes in a signal (provider), and this applies to any online trading- sports betting, binary options. etc. MY RULE REMAINS "DON'T USE ONLY ONE SIGNAL PROVIDER NO MATTER HOW GOOD IT IS." Search Facebook for forex signals and Forex groups, join them and get information from a rich array of experienced and novice Forex traders. Now, you may not have heard of PAMM before but you can read up the wikipedia page of it here. It stands for Percent Allocation Management Module (or Percent Allocation Money Management). It is what I intend doing (one of my goals is to become a PAMM trader) for my investors who eventually decide to invest in my skills. I have already given you enough reasons why I can trade for you. If anyone is still not convinced, then they probably never will. But you can give your money to any other professional in the popular brokers online. 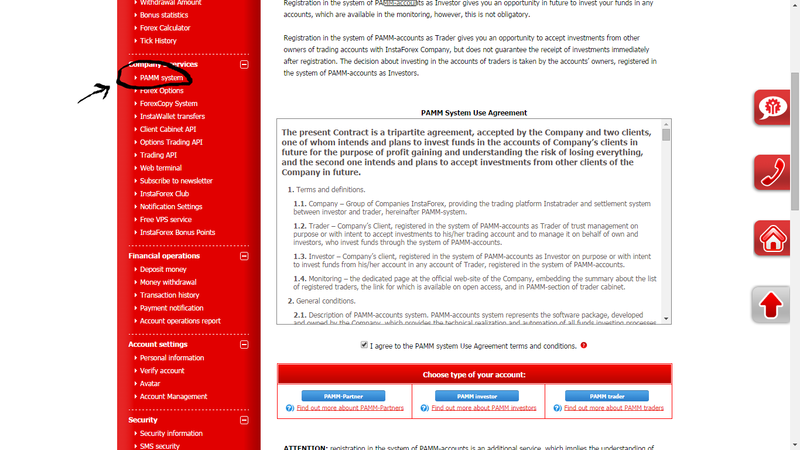 Since I am very conversant with Instaforex, let me explain how you can register for theirs. 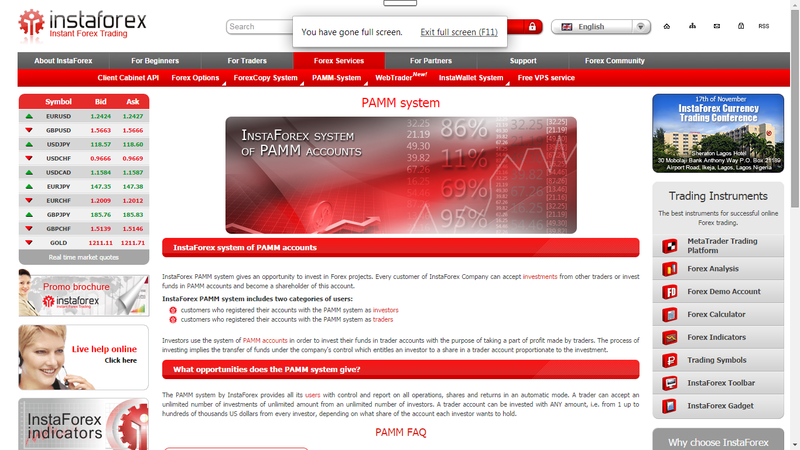 If you want to give your money to a PAMM trader, you have to register as a PAMM investor from inside your cabinet. The disadvantage is that you will be charged up to 35% of your profit -partly for the broker, and the rest for the PAMM trader. There something similar to this in binary options too. An Expert Advisor is a piece of software written specifically for the MetaTrader Platform. An Expert Advisor can just advise traders which trades to make or can be programmed to automatically execute the trades on a live account. Expert Advisors are very flexible pieces of software that can take any information into account that is available on the metatrader platform. They are written in their own proprietary programming language called MetaQuotes Language Version 4. You can check this link if you want to learn how to program your own expert advisor. In summary, they are simply computer programs written by programmers to help make your trading successful. If you missed my last article on Trading Forex Profitably (II), I already explained how you can set up a robot/expert advisor to make trades for you on your account. I shared with you the trading strategy I used to take $1 to over $250 in 5 weeks. Truth is that you will have to personally develop a strategy for yourself based on your own personality. All my students have their own strategies, and most of it came by 'elimination' method (trial and error). If I trade with less than $10, I use the risky strategy I published in that article. I do not impose my strategy on people. If I trade any account larger than $500, the strategy I use is "make 1% daily/5% weekly by changing your leverage to 1:50 first, and then choosing a very small lot size". I give myself a 2-year target of making over 10000% on such accounts as I shared in the article 'How you too can turn $12,000 into over $1.5million'. If you want to be serious about being a Forex trader and not a gambler, reduce your lot size to 1:50 but start with a substantial capital, else you might be frustrated by the little profits (and losses too anyway) that you will be seeing. I have shared with you the sites I use in checking up if a Forex broker or PAMM trader or signal provider is scam in the article 'Beware of scammers'. Phew! I am tired. That was so much. I hope I have done well to help you on the way to becoming rich and comfortable through Forex. No matter the path you choose to make money in Forex -Trader, Investor or through Bureau De Change, you can and should be successful. Now when you hear Forex, don't think scam anymore, don't think gambling anymore, and more importantly, don't lose your money anymore.